Here is a great calculator that I found on www.finewoodworking.com. Be sure to visit them and enjoy their great selection of articles and tips. The Sagulator is an online calculator that can determine potential sag in a shelf based on just a few basic pieces of information. Enter the shelf material (the calculator handles hardwoods, softwoods, and sheetgoods), shelf thickness, width, and length, and the load on the shelf, and the program runs its calculations to determine how much the shelf will sag. An answer of more than 0.02-in. per foot of shelf means you need to make compromises -- use a stronger wood, or make the shelf thicker, or wider, or shorter, or add wide edging. 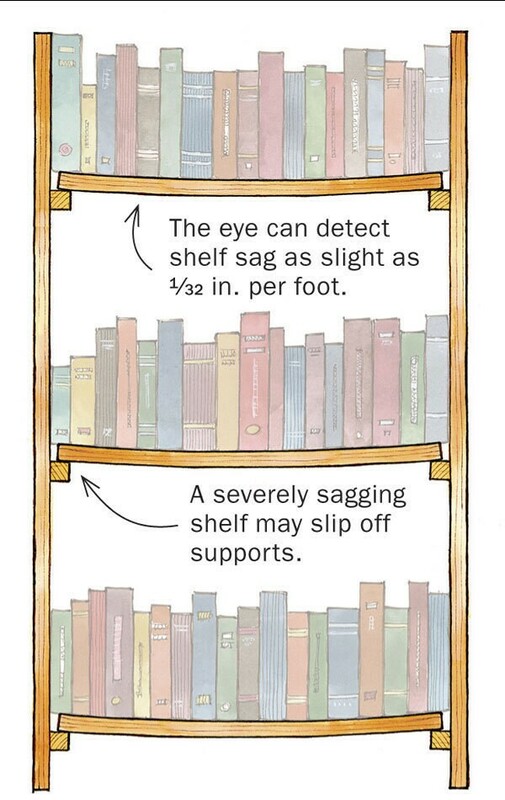 The Sagulator employs published beam deflection formulas for calculating shelf sag. These formulas are available in a number of engineering handbooks as well as Bruce Hoadley's book, Understanding Wood: A Craftsman's Guide to Wood Technology. The Sagulator also uses elasticity measurements that were culled from a variety of sources including the U.S. Forest Products Laboratory.